The most wonderful time of the year... is here! It's my favorite time of year, and Chicago knows how to do festive glamour. Seeing traditional decorations on stunning historic buildings all over the city, is truly a beautiful sight for a vintage lover like me. 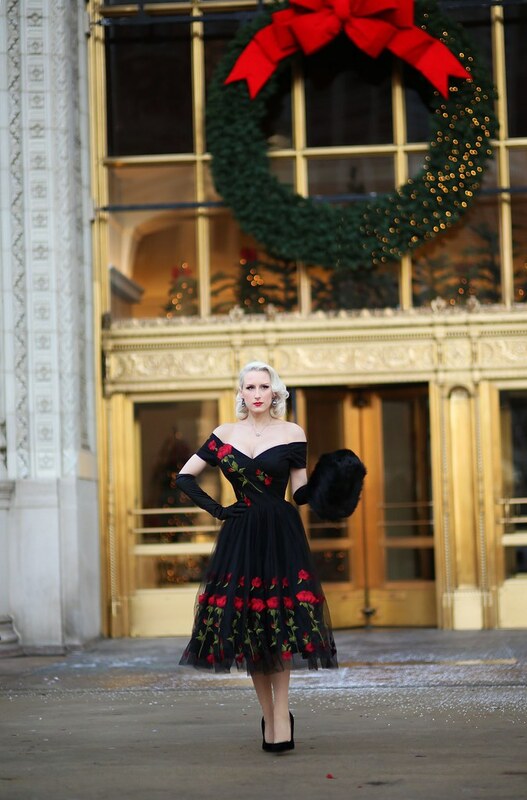 Wreaths and an enormous Christmas tree adorn the 1925-built French Renaissance style Wrigley Building, and serve as a beautiful backdrop for the debut of my Pretty Dress Company holiday series! In celebrating the glamour of the holidays, we begin today with Red Rose Rendezvous. Decorated with a stunning red rose embroidery atop a delicate black tulle background, this special holiday edition of the Fatale Dress is a feminine dream. 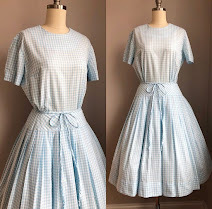 With a boned bodice leading to a striking off shoulder neckline, and fully lined skirt with attached petticoat, this is the kind of high quality frock that I will treasure for years. Not to mention, her original design is the epitome of vintage femininity and feels like an authentic 1950's dress. 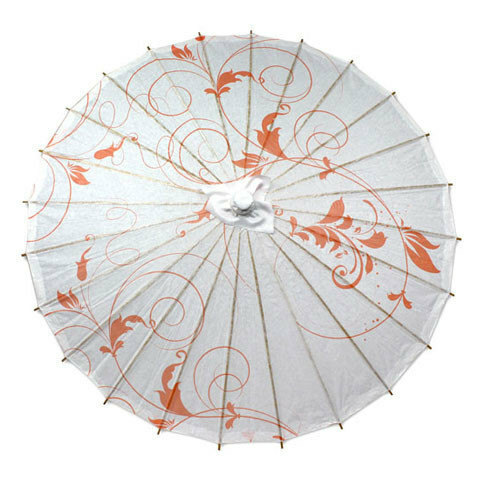 For city life, dashing out of a taxi and into a holiday soiree or dinner date allows for the sufficiency of elegant stoles or muffs on a chilly evening. Fall and winter accessories are my favorite, so I absolutely love being able to don such pieces during the colder seasons. My vintage muff, satin gloves, and silver/crystals accompany today's ensemble. Stay tuned for Part 2 of my Pretty Dress Holiday Series coming up soon, and in the meantime, view the stunning new collection here. To my American Readers, Happy Thanksgiving!